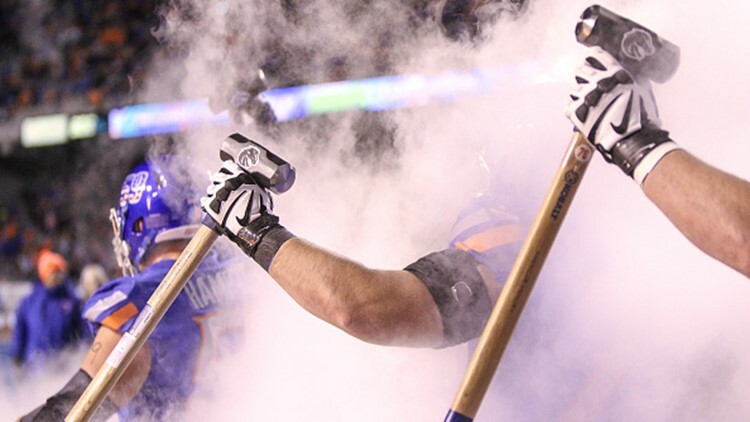 Offensive linemen John Molchon and Ezra Cleveland of Boise State carry out the Hammer to start first half action against Air Force on November 18, 2017 at Albertsons Stadium in Boise, Idaho. Some games may be moved to Thursday or Friday, and we don’t know any of the start times (that will be huge). But you can start mapping out your fall. BOISE, Idaho — Tuesday, February 5, 2019. It’s a fluid document, but at lease we know which week is which (a lot earlier than normal, I might add). All 12 Boise State football games this season are listed for Saturdays, and 12 kickoff times are “TBA.” But it’s unlikely any of the games will move off their appointed weekends. The Bronco schedule certainly isn’t as symmetrical as in year’s past. For the first time in 12 years, Boise State will have three consecutive home games—and for the first time in 21 years, all three are in September (Marshall on the 7th, Portland State on the 14th and Air Force on the 21st). That means there’ll be road games bunched together down the line, and twice later in the season Boise State will have back-to-back road games. Senior Night is early—against New Mexico on November 16. The Mountain West scheduling rotation dictates that Boise State switches it three West Division opponents this year. It’s UNLV, Hawaii and San Jose State instead of San Diego State, Nevada and Fresno State. The Broncos face the Rebels, Rainbow Warriors and Spartans over a four-week period in the middle of the season. Because of the way the 2019 calendar falls, the college football season is longer this year. The Broncos will have two byes: on September 28 and October 26. What’s curious to me: why is the season finale at Colorado State on November 30 not flip-flopped with the game the week before at Utah State? The Broncos-Aggies matchup shapes up as an enormous one in the Mountain Division, just like last year. The word “portal” is weaving itself into the college football vernacular. As in, “transfer portal.” Fortunately, Boise State uses it sparingly. Colorado State uses it more liberally. The Rams get some great players, but they also get baggage. Wide receiver Preston Williams transferred to CSU from Tennessee, and last year he had a spectacular season: 96 catches for 1,345 yards and 14 touchdowns. Williams had nine receptions for 154 yards and a TD in a loss at Boise State in October. So, he declared early for the NFL Draft. But Williams was not invited to the NFL Combine due to his domestic violence arrest in September, 2017, according to the NFL Network. He was arrested again a month later and was suspended for the rest of that season. Needless to say, Williams’ road to the NFL has become much more difficult. Boise State’s two most visible graduate transfers in recent years have both panned out well. In 2015 it was Stanford running back Kelsey Young, who backed up Jeremy McNichols with 511 rushing yards and eight touchdowns. In 2017, of course, there was Kansas quarterback Montell Cozart, who played such a key role in the Broncos’ 11-3 season. Cozart threw for 754 yards and 10 touchdowns and rushed for 361 with four more scores. This year it’ll be the intriguing Division III kicker from Trinity College in Connecticut, Eric Sachse. And a reminder: tomorrow is National Letter of Intent Day. Or should we call it “Signing Day Jr.” considering the impact the December signing day has had on recruiting. On the day we digest Boise State’s new football schedule, we take note of the tipoff time for tomorrow night’s Broncos-UNLV in Taco Bell Arena. It’s a 9 p.m. start for what promises to be a pivotal game in Boise State’s Mountain West campaign. But it’s the only start time later than 8 p.m. for a home game this season, and the Broncos are hoping fans will make an exception to their bedtimes to come out for this one. In years past, a late tip may have been offset by the appeal of a program with UNLV’s tradition. But the Rebels have endured losing seasons in two of the past three years and aren’t as easy a sell. They haven’t been to the NCAA Tournament since 2013. Nevada leapfrogged Michigan and Michigan State in the AP Poll Monday, moving back up to No. 6. The Wolf Pack is perched in the same spot in the Coaches Poll. As for those Martin twins? Caleb is the Mountain West Player of the Week, and Cody has been named one of 10 finalists for the Cousy Award that goes to the nation’s best point guard. And Caleb and Jordan Caroline are among the final 20 in the running for the Wooden Award. Two games tonight will have a telling effect on Mountain West standings below the Pack peak. The winner of the Utah State-Fresno State game will have sole possession of second place, and in Albuquerque, San Diego State tries to stay upper-echelon in the conference—and keep New Mexico lower-echelon. REMEMBER FORMER BOISE HAWK LUKE HAGERTY? This has been prominent in MLB news the past several days: the incredible comeback story of 37-year-old pitcher Luke Hagerty. Ironically, Hagerty has signed with the Chicago Cubs, the team that drafted him in the first round in 2002 and assigned him to the Boise Hawks. He dominated that summer, going 5-3 with a 1.13 ERA. But Hagerty underwent Tommy John surgery the next year and was never able to bounce back. He had short stints in Boise in 2004 and 2005, and in the latter one he gave up a staggering 23 earned runs in just 6 2/3 innings. Part of it was the yips, Hagerty admitted in an outstanding story at ESPN.com written by Jeff Passan. He and the Hawks and the Cubs tried all sorts of experiments—from weird target drills to sports psychologists. Nothing worked. Hagerty hasn’t pitched pro ball of any kind in 11 years. He dropped baseball altogether (and baseball dropped him) after a stop in an independent league in 2008. Then he picked up a ball again in 2012 at a sports performance center he had founded in Scottsdale. And he threw it. And before long he was hitting 94 miles per hour, then almost 99 mph last year. Hagerty followed with intense sessions with a brain researcher who got him to rediscover his “game persona.” Then he floored scouts at a Seattle workout three weeks ago. And last Friday, the Cubs signed him to a non-guaranteed minor league contract. Passan points out that Hagerty could be the oldest pitcher with no foreign experience to debut in the majors since Hall of Famer Satchel Paige in 1948. Late-round draft picks who are released after their third season are often in a precarious position. So it is for Tanner Vallejo. The former Boise State standout was waived yesterday by the Cleveland Browns, five weeks after being placed on injured reserve with a hamstring injury. Vallejo appeared in 13 games with one start last year for the Browns. He logged 20 tackles and forced one fumble on defense and added seven special teams tackles. Vallejo was drafted in the sixth round by the Buffalo Bills in 2016. Seattle’s first trip to the Super Bowl is undone by bad decisions, bad calls, and bad karma in a 21-10 loss to the Pittsburgh Steelers. The Seahawks appeared to dominate the game but couldn’t make the big play, while the Steelers did—the final nail being a 43-yard touchdown pass on a reverse from wide receiver Antwaan Randel-El to the game’s MVP, Hines Ward. But most scrutinized was the officiating that took away, at best, all of Seattle’s momentum—and, at worst, two potential Seahawks touchdowns. Meanwhile, former Boise State standout Kimo von Oelhoffen took home a Super Bowl ring with the Steelers.